I am very excited to be able to say that I have finally published my collected poems in a single volume. 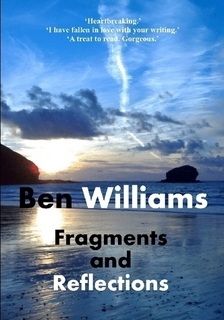 Like my blog, it is also called ‘Fragments and Reflections’ and is available in hard copy, under my Lone Crow Publications label, direct from Lulu and also from Amazon. For those of you who prefer an eBook, you can buy Fragments and Reflections from Amazon, Barnes & Noble (nook), iBooks and Kobo. You can download the free sampler here. What kind of poetry is it? I would describe it as a collection of modern verse for every facet of life and for every emotion. There are poems born out of love, of dreams, of wandering in the countryside, of working in the city and of generally raging against the world. Nature, the city, love, lust, betrayal, war, death, homelessness, spaniels… You will find them all inside. If you take a peek inside, I hope you find something that speaks to you. I often wonder in more generous moments if the colossal indifference we, as a society, show the homeless – particularly those forced to scavenge an existence from the streets – is because of the fear we experience in recognising that there is the finest line between the life we live and the life we could live if just one or two things changed. We often fail to see the human being, with hopes, dreams and aspirations that now ekes out an existence on our streets. Somehow he or she is less than human. And sometimes we see the most violent reaction to a person asking for coin to survive. There is an automatic assumption that they are a scrounger or criminal, that they want the money for drink or drugs (and if they do, that in and of itself is a reason not to give them money). We are more comfortable with attaching a label. I have struggled to reconcile street living with the values of a civilised society. I still can’t make it fit.